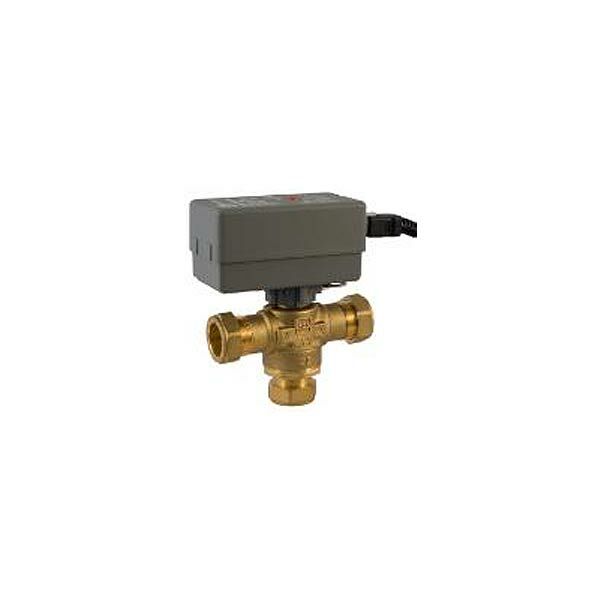 LK 525 Zone valve for switching flow between heating and hot water. LK 525 MultiZone is a motorised 3-way zone valve for On/Off control. The zone valve is designed with a turning slide which allows it to withstand a larger pressure difference and reduces the risk of it stalling after a long intermission. This makes it especially suited for heat pump applications where there can be long intermissions between the changes to the direction of the flow during the warm season. On the upper surface of the actuator is an indicator that shows which port is open. The zone valve must not be installed with the motor underneath the valve unit. In case of a power failure, the valve cone stays in its current position. When the power is switched off, the valve can be manually set to the centre position, which distributes the flow between the heating and tap water circuits. Remove the motor and turn the spindle about 30° or turn until hot water flows through both valve ports. When the power is restored, turn the valve back to its original position and reinstall the motor. Please note that the motor can be installed in only one position.